While Valentine’s Day reminded us that the heart is a symbol of love, fewer connect that symbol to our own personal heart health. As February is also recognized as American Heart Month by the American Heart Association, we should also focus our attention on lifestyle factors that can benefit our heart, whether through smoking cessation, increased physical activity or diet modification. While this month highlights these key factors that impact heart health, our heart is something that deserves our attention all year round. How do we incorporate heart-healthy ingredients into our diet, and what are the mechanisms by which they function? Discussed below are a few key foods to incorporate into the diet on a frequent basis. Oatmeal: The key to oatmeal’s success as a heart-healthy food is likely two-fold. First, oatmeal contains soluble fiber, a type of fiber that is unique in that it has the ability to trap cholesterol within the intestine, reducing absorption. This results in reduced plasma low-density lipoprotein cholesterol (LDL-C) concentrations and reduced risk of cardiovascular disease. With 2 grams of soluble fiber per half-cup dry serving, oatmeal provides a good start toward the goal of 10 grams of soluble fiber a day. While oats have the highest proportion of soluble fiber compared to other grains, other good options include beans, peas, barley and citrus fruits. Second, oatmeal is a low-fat breakfast item that can serve as an alternative to eggs, bacon and the donuts we gravitate to on our drive to work; when these breakfast items are replaced with a low-fat, low-calorie, high-fiber food, health benefits are soon to follow. Nuts: Increased nut consumption has been associated with a reduction in cardiovascular disease risk and mortality. In addition, improvement in CVD risk factors such as decreased LDL-C, triglycerides and inflammatory markers have been seen in clinical trials. However, not all nuts are created equal. 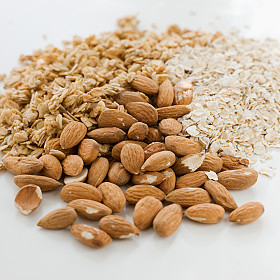 Two of the most heart-healthy nuts are almonds and walnuts. Almonds are high in fiber and contain monounsaturated fatty acids, a group of fatty acids that have been shown to decrease LDL-C and increase high-density lipoprotein cholesterol (HDL-C). Walnuts are unique in that they contain high amounts of a-linolenic acid, an omega-3 polyunsaturated fatty acid beneficial for the heart. Walnut consumption can decrease total and LDL cholesterol, and potentially possess anti-inflammatory activity. However, it is important to keep a serving of nuts to 1.5 ounces each day. Nuts have been approved by the Food and Drug Administration to possess a health claim that states: “Scientific evidence suggests but does not prove that eating 1.5 ounces per day of most nuts, as part of a diet low in saturated fat and cholesterol, may reduce the risk of heart disease.” Just remember, only consume what can fit into the palm of your hand. Fish: Fish contain high amounts of certain omega-3 fatty acids [eicosapentanoic acid (EPA) and docosahexanoic acid (DHA)], fatty acids that have been associated with reduced triglyceride concentrations, and anti-inflammatory and anti-arrhythmic properties. The American Heart Association recommends that healthy individuals should consume 4 ounces of fish at least two times per week, while those with heart disease should consume 1 gram of EPA/DHA each day. As with nuts, not all fish are equally heart-healthy. Salmon (both farmed and wild) contain the highest concentration of EPA and DHA with over 2 grams per 4-ounce serving. In addition, sardines, rainbow trout and white tuna are also good sources of EPA/DHA (1.0-1.5 g/4-oz serving). Alternatively, fish oil supplements are available to consumers, but it is best to get your nutrients from food. Avocados: While we don’t normally consider guacamole as a health food, its primary component, avocados, can be considered a healthy part of the diet. With high monounsaturated fatty acids (the ones already mentioned to improve your cholesterol profile) and 7 grams of fiber per half an avocado, this food could prove to be a healthy component of anyone’s diet. As with all other foods, portion size is important, as half an avocado has approximately 160 calories. So go ahead and have some guacamole … just be sure to scoop it up with carrots or pita bread rather than digging into a big bowl of chips. Heather Rasmussen, PhD, RD, is an assistant professor with the Rush University College of Health Sciences. This entry was posted in Food and Nutrition, Heart and tagged American Heart Association, American Heart Month, healthy foods. Bookmark the permalink. The problem I have with nuts is portion control. I have tried all sorts of tricks to keep my portion size low but they taste so good I end up eating more than my fair share. But they are better than eating a bag of cookies which is what a used to do, so relatively speaking I’m ahead of the game. El problema que tengo con frutos secos es el control de porciones. He intentado todo tipo de trucos para evitar que al tamaño de la porción baja, pero su sabor es tan bueno que termina comiendo más de mi parte. Pero son mejor que comer una bolsa de galletas que es lo que solía hacer, por lo que en términos relativos estoy delante del juego.